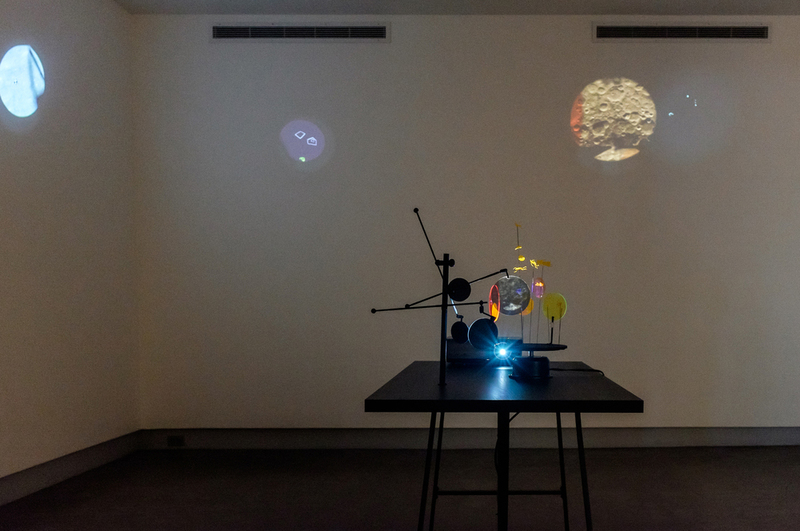 A hand-drawn animated installation, Hypothetical Stars employs the artist's marks as interventions into 16mm footage taken from the NASA Apollo 12 mission. Being the mission after the first moon landing, it was notable for being the first to bring a color TV camera. And for the fact that, upon landing, the camera was pointed at the sun and inadvertently destroyed, immediately terminating the television broadcast. This piece asks us to consider a new view of that which we cannot see with the naked eye, where images sent back from the outer reaches are not seen as scientific truth but as deeply connected to our own desires and mirrors of our unconscious. Hypothetical Stars uses thrown shadows from tabletop dioramas and reflected and refracted animated projections to create a universe of hypothetical stars, moons, and planets. This installation coincides with two films completed in 2015 based on NASA footage released in the Spring of 2015. Originally Commissioned by Richard Herskowitz for the 2015 Houston Cinema Arts Festival. 2015 Spaceness, Seaview, WA. Feb.